Messages fly. But so does the banog (Visayan eagle) in Allan Cabalfin’s exhibit (“Inday-gen-news: Recentering the Culture Bearers,” UPV Art Gallery, November 4-18, 2011) composed of batik and acrylic paintings and terracota sculptures. 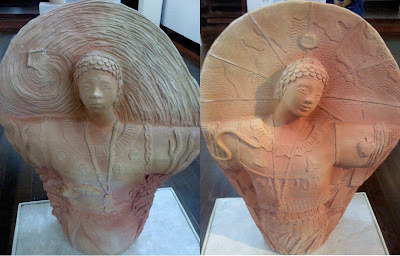 Here, the image of the eagle is transformed into a Panay-Bukidnon girl (inday) dancing, though without movements. She is, like the crucified Christ, caught and suspended on air, frozen, yet fluid in her eternal gesture. She flies, like the bird she models, to and fro, past and present, rural and urban, farm and city, sea and air, earth and sky, material to the spiritual, nature to culture, in all serenity. There is no anger here, despite seeing the destruction of our natural habitat, despite pollution and terror, despite injuries and insults, by waves and by the web, in the opposition of myth and history, our girl-bird does not have the interrogating gaze, nor the avoidant eyes of an afflicted, but only deep understanding. Suspended on air, she carries with her the message once we thought better off tied to a pigeon’s foot. No, Cabalfin’s paintings and sculptures are what we see in the center-altar of our churches. Flying. The image of the girl-bird does not speak. It does not open its mouth. It is muted, the absence of utterance; the absence of parole. But it speaks, paradoxically though, through its unseeable movements; the presence langue. There is music in the outstretched arms about to move, or already moving. The girl dances like a bird and we are seduced to re-producing the sounds and imagining the two outstretched arms of the dancer moving up-down-up-down, repeating up-down-up-down. The image then starts to move. At first alone, with its hands, later with its feet; the body moving on its own. Then other images appear to be moving on the upper garment---clouds, birds, flowers, a carabao, a monkey, a wild pig, a snake (eyeing an apple), wrapped flowers (flores para la muerte), plants, people (running and afraid), highways and cars. The music of the binanog dance travels from different time and space, penetrating, encircling, and moving out again. It brought its dancer to the natural elements (eating-earth, drowning-water, blowing-wind, all-consuming-fire), to the archi-cultural constructs (circling flyover, exploding twin towers, multiplying shanties, the long and busy JM Basa St.), man-made machines (oil-spilling tanker, land-grabbing bulldozer) and to onced untouched romantically constructed idea of paradise, where one could gather animals and plants and enjoy a bountiful harvest, where birds are suppose to sing and flowers receive without malice the animal equivalent of sperm. There is movement in an unmoving image of the Panay-Bukidnon dancer. And the movement is with us. In our gaze. If we get the movement, we also get the meaning. This is the only way that the flying will take its course. One student-viewer asked her companion why the outstretched arms of the Panay-Bukidnon girl? Unsolicitedly, I gave off the answer that she is modelling the dance of the eagle. Right there and then, like a snap of a finger, she retorted: “Because the indigenous flies from one place to another!” So they left the gallery happy that they have the meaning that they could bring home with them and, if time and luxury permits, cook and serve as hors d’eouvres to an evening of intellectual conversation. But I think there’s more to the image, the music and the text of the paintings and sculptures than just the concept of the indigenous being re-presented from different/differing time and space. The concept ‘indigenous’ appears, since it is always at the center of the frame (even sculptures are framed), insistent in its authority on truth---it occupies the center so it aspires for the center. It articulates positionality in a play between past and present, good and evil, ancient and modern. It represents power. Thus, marginalization and centralization, are two inseparable concepts. One would not have power without the presence of the other. 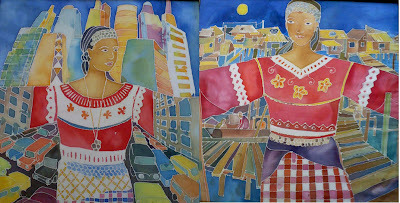 The marginalization of the indigenous people, re-presented by image of the the Panay-Bukidnon girl, does not serve just as inspiration to artists, she too could become a national marker that needed rcognition. In art, we have this element called ‘emphasis’ which simply tells us where to direct our eyes. In theater, when we think of blocking that suggests authority, we always opted to use the center. It is where the character of a king, a president, a father, and God sits. 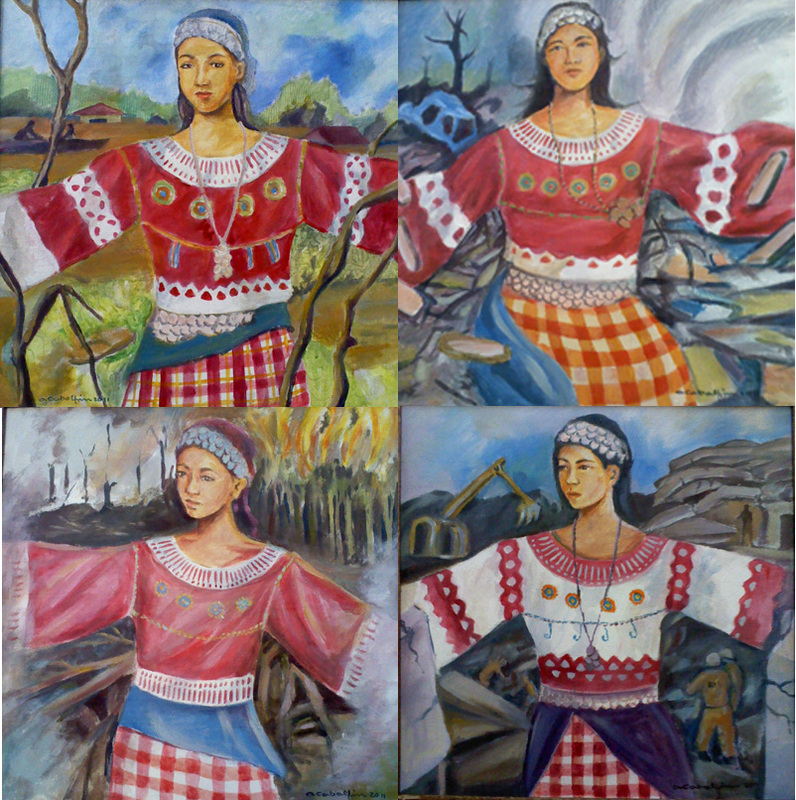 Putting the dancing Panay-Bukidnon girl, with its symbolic significance, at the center of the discursive frame invites some re-thinking on the way we look at nature and culture. Her powerful presence invites a (mis)reading that could affect the future not just of the indigenous people but of the human race as well. This is supposed to be the ‘news’ that our ‘inday’ (girl) will write for this (‘gen’)eration. Or so I/we thought.